The Pop Top Retractable Feather Duster is a product of Wilen Professional Products, a division of Continental Commercial Products, which has been in operation since 1939. This economical lightweight feather ostrich feather duster is constructed from extra soft gray ostrich feathers secured into a plastic handle. The feathers can be retracted into the handle, which protects them and allows this ostrich feather duster to become compact for easy storage. This portable duster is perfect for quick dusting projects either at home or at work. •Suitable for use on electronic devices since the duster does not rely on static electricity to attract dust. Overall, consumers who have purchased this retractable ostrich feather duster report it is a good value and find that it work well for quick dusting projects. Wine salesmen report it is easy to carry with them to use to dust bottles at stores when they visit. Shopkeepers echo this sentiment stating the Pop Top Retractable Feather Duster is a great tool to dust items on shelves because they do not have to be concerned about merchandise getting scratched or damaged. Owners of electronics stores also feel confident when they use this duster because it does not use static electricity to attract dust, which can potentially damage their wares. People who use this retractable feather duster at home state it is great for quick dusting of table tops, lamps and shelves. Some consumers have had difficulty with the feathers not completely locking in place when extended, but this was only mentioned in a small number of reviews. 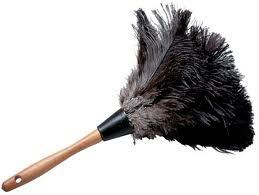 Most people are please with the performance of this economically priced retractable feather duster.